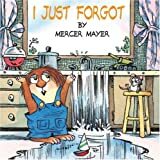 In the beginning of Mayer’s book, our hero looks straight at the reader, slightly lifts both arms, and states: “Sometimes I remember, sometimes I just forget.” For example he (or she?-it’s difficult to tell the gender in this “Little Critter” book) puts his dishes in the sink, but forgets to put away the milk. Humorous twists on the `I remembered this, but forgot this’ motif lift this book above the ordinary. For example: “I didn’t forget to feed the goldfish, he just didn’t look hungry,” and, after a bath, “I didn’t use soap, but I didn’t forget to. I just don’t like to.” His mother is alternately tired, frustrated, and amused, and the clever story ends on a warm note. This is a sweet and simple story that manages to cover many familiar situations with honesty and empathy for all involved. Watch for the little mouse friend on every page! Mercer Mayer has created another wonderful book in the Little Critter series. He has an uncanny ability to connect with children on their level. This book has wonderfully bright pictures that reach out and grab the child’s attention. It will bring a smile to your face as you learn that it is okay to forget, because every child forgets sometimes. This book taught kids it’s ok to forget somethings in life, but it also teaches them they cannot forget a lot of things, like how much they love their parents. but if you forget minor things like washing the dishes it’s ok. I enjoy reading Mercer Mayer books, he can really connect with kids and get on their level, I think kids pick up on the morals. You may get into trouble if you forget things, but all kids do..